Slovenian (or Slovene) is a Slavic language from the South Slavic group, most closely related to Croatian and a distant relative of languages such as Russian. Slovenian should NOT be confused with the Slovak language, which does not have much in common with Slovenian, apart from both being Slavic languages. Interestingly, both languages call their own language by the same expression – slovensky/i, sloven(s)cina – which literally means Slavic in the old Slavonian. 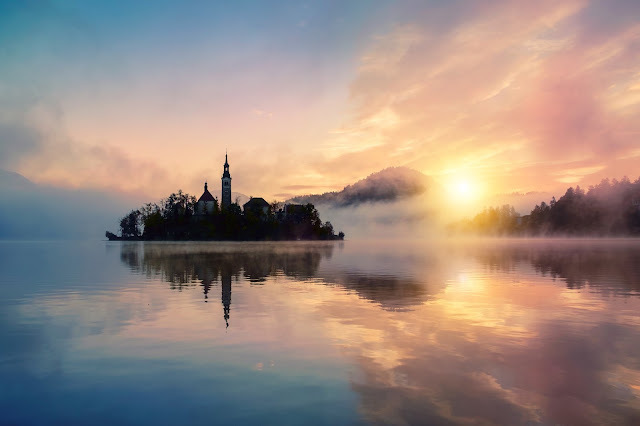 Slovenian is spoken by about 2 million people in Slovenia – a small country, but with both high mountains (Alps) and a sea (the Adriatic sea), as well as Slovenian communities in neighboring countries and immigrants around the world. Slovenian is also an official EU language. Church in the middle of Lake Bled, Slovenia. Slovenian is a heavily inflected language with some ancient grammatical peculiarities, such as the dual grammatical number. Despite the small number of speakers, the dialects are heavily diversified and strong dialects from opposite sides of the country, influenced by neighboring languages, are practically mutually unintelligible. This was due to the fact that compulsory schooling was in other languages than Slovenian (mainly German and Italian). Standardized Slovenian as a national language was formed in the 18th century based on the Upper and Lower Carnolian dialects. Slovenian uses the Latin alphabet, without the letters Q, X, Y, W and with the addition of a few extra letters. The letters Q, X, Y, W, however, are used as independent letters in encyclopedias and dictionary listings (and as such are included in the alphabet here).